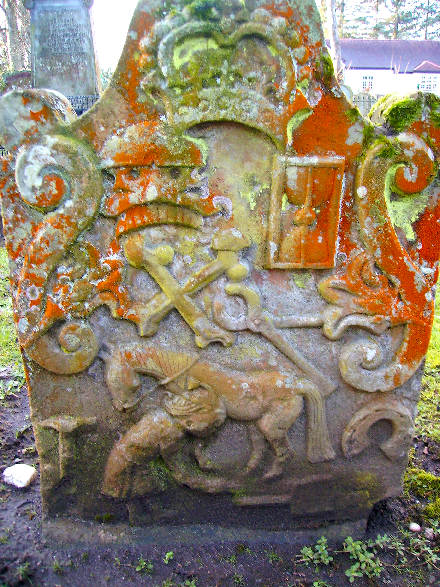 Lichen covers this fascinating old gravestone in the Alloway kirkyard near Ayr, Scotland. Surely a farrier lies here. Was he the farrier who inspired the lines in the poem: "That every naig was ca'd a shoe on, The smith and thee gat roaring fou on"? (Tam and the smith had a drink for every shoe that was nailed on.) Or did he die earlier so it was part of this scene: "Coffins stood round like open presses / That shaw'd the dead in their last dresses /And by some devilish cantraip slight / Each in its cauld hand held a light." There are many farrier headstones in cemeteries around the world. Grand anvils and headstones sporting horseshoes decorate churchyards and forgotten family plots. But I think this one is suitable for Halloween! You'll find this stone in the churchyard at Alloway, near Ayr in Scotland. Was this farrier also a pirate (note the skull and crossbones) and someone with royal ties (note the crown)? This graveyard is not far from Closeburn, the home of the late famed farrier Edward Martin, and I must assume that Edward knew of this stone, though I don't recall him telling any stories about it--and this stone surely has a great story! Alloway is the town of Robert Burns's birth as well as where he set his famous poem, Tam O'Shanter. This is the universal tale of a man who simply stayed too late at the pub one night, drinking with the smith (perhaps the one buried here?) and his other pals, and had to count on his good mare Meg to get him home in foul weather. Tam was shocked to see half-dressed women from the village cavorting with the devil. But in his drunken state he called out in admiration to one attractive woman in a "cutty sark", which set them all in pursuit after him. The poem is interpreted many ways when it comes to people's views on alcohol, witchcraft and lewd behavior. But there is never any doubt about the character of the horse involved. Tam gives his mare Meg her head to find her way home and probably snoozed in the saddle. Passing through Alloway, he's startled awake to see the church ablaze, with witches dancing in every window as the devil plays the bagpipes and the graveyard's coffins open wide. 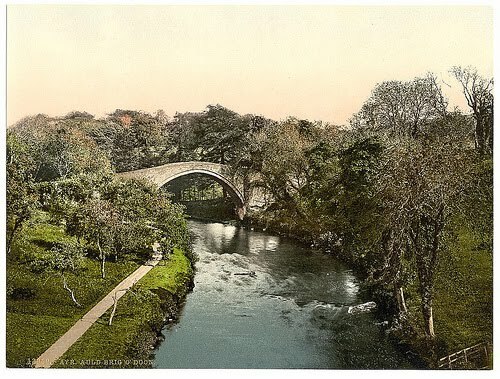 The Brig o'Doon, or bridge over the River Doon in Alloway. Apparently, a witch can't cross a running stream so Tam spurred his mare on. Once across, Tam O'Shanter would be safe from the witches, though he would still have to answer to his wife. But his horse would never be the same again. But let it be known that Meg the Mare takes care of her rider that night...though she spends the rest of her life as testimony that something did happen on the way home, even if it was the most elaborate and world-famous tale a husband ever made up for why he was late coming home from the pub. Spooky enough for Halloween, don't you think? So here's the way the story goes...I''ll tell the short version because it's an Irish story and you know how long they can get. There once was an Irish blacksmith named Jack. He was a miserable man, and he spent his nights in the pub trying to make everyone around him miserable, too. One night he made a deal for one more drink, but he had no money so it had to be paid for by the devil. The devil demanded to be paid back, but Jack tricked the devil. That's never a good idea. The devil promised Jack that he'd take his soul. When Jack died, he was refused admission to heaven for all his evil, selfish deeds, and foul moods. He was sent straight to the gates of hell. Whom do you think was waiting for Jack? The devil met him at the gate to Hell and recognized him as the Irishman who had cheated him. The devil crossed his arms and refused to even let Jack into hell. Where would Jack go? The devil didn't care, but Jack had better get going. Jack pleaded for a coal so he might see his way as he wandered through the darkness. The devil granted his wish and squashed a glowing coal into a half-eaten turnip. He handed it to Jack with a smirk. Jack wandered off and guess what? He wandered forevermore. It's said his coal and turnip could be seen across the countryside of Ireland at night as he wandered aimlessly, the ultimate ghost. And of course as a smith, Jack had the skill to keep the ember going. He made the most of the devil's generosity. Irish children began to imitate Jack's lantern and Irish-American children switched from turnips to pumpkins on this side of the Atlantic. 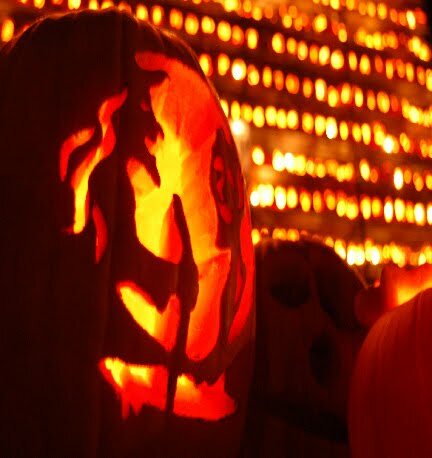 And so it is that so many of us still place glowing vegetables on our doorsteps on Halloween to scare away the haunted souls...like Jack, the grumpy, cheapskate blacksmith. I've been saving this picture for today. It's from a portfolio of images, mainly farriers, taken at the Smithfield Horse Market in Dublin, Ireland, one of the last urban horse sales in western Europe. The travelers bring horses and ponies and donkeys into the city the first Sunday of each month to sell or trade them. They've been doing it exactly this way, in the shadow of the Jameson's whiskey distillery, since 1665, as much as the city has tried to stop this chaotic manure-producing festivity. Dublin is one of the last cities where horses are kept within the city by private owners, many by young boys who tether them on any available greenspace. One Dublin photographer, Teresa O'Brien, is especially taken with the farriers who skip church and show up to shoe the horses at the market before they are sold. But she only photographs their hands. I've never seen the rest of these men. 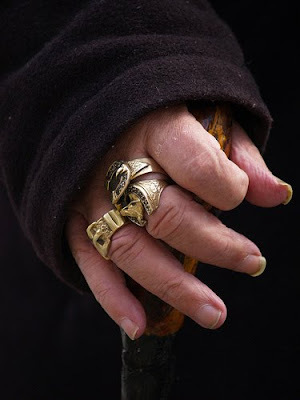 Later, she moves through the crowd and her lens finds a hand on rusty hames or in this case the hand of a traveler (gypsy) matriarch's multi-ringed fingers. Imagine this woman draped in her long dark hooded coat and leaning on her cane. She is walking among the horses on a chilly October morning. She speaks to no one. Is she buying or selling or is there something spooky going on here? Is she the ghost of horse markets past? Click here to read a little more about and see a little more about Smithfield Horse Market. Smithfield Horse Market and the gypsy horse fairs of Ireland and England are some of the last horse fairs. I grew up staring at a print of the painting The Horse Fair by Rosa Bonheur (above; the original painting is 16 feet long and hangs in the Metropolitan Museum of Art in New York City). It is still one of my favorite paintings because there is so much going on and the horses are so well-formed. But if you think about it, what will go on this Sunday morning at Smithfield hasn't changed much from Bonheur's basic scene, which shows the horse market in Paris in the 1800s. Someone should document the few horse fairs that still exist. I know there are still big ones in India and Mongolia--where else are they still held? Today I hurt my eye and it made the world a different place. Depth perception was different, some things don't quite line up, and this computer screen is a little blurry so this post will be a media-rich one. I'll let the videos tell the story. And the story is exactly what I have been experiencing: how do we look at things? You read research reports and case studies and observations on this blog all the time, but they are from the viewpoints of different original sources. Here are some examples of the sources the Hoof Blog uses. This is a computer-generated leg model from the University of California at Davis. The model lives in a perfect world. Someone designed a limb with arbitrary (or perhaps intentional) conformation and measured the resulting tendon, ligament and muscle forces if this ideal limb was moving over a perfectly smooth, non-deforming surface. This is what we now call "traditional" two-dimensional video analysis, often used for before-and-after shoeing and trimming evaluation. This very brief clip is 3-D analysis. You might want to use the play button to start and stop it and see more detail. Finally, here's high-speed video, or what you might call high-quality slow motion. This polo pony is exhibiting the same stride characteristic as the computer model at the top but wow! he is influenced by the weight and lean of his rider and the variable deformability of the field as well as, no doubt, probably some conformational traits that offset his limb alignment. This is the real world. There are plenty of other ways to capture horses and model their movement to study and analyze them; the idea here is that when you read an article, the authors may be extrapolating data from a computer model or from subjective observation with no data collection. You have to read the fine print and always take into consideration how a study was conducted and how many horses were in a study. Does the moving horse interest you? Cornell University will host a veritable festival of motion capture, slo-mo and gait analysis at the 26th Farriers Conference November 14-15 in Ithaca, New York at the College of Veterinary Medicine. The early registration deadline is Friday so get organized and save $50 over the on-site fees. Speakers at Cornell include farriers Scott Lampert of OnTrack Equine in Minnesota and Mark Aikens from Anglia Equine in England, both of whom are leaders in using videography in analyzing how shoeing and trimming effect horses' movement. Dr. Jeremy Rawlinson of Cornell will demonstrate the use of Cornell's force plate system and de-mystify the concept of ground reaction forces. Patrick Ryan was, according to this slip of paper, a doctor (?) of horseshoeing in Baltimore, Maryland in the late 1800s. You might have to double-click on the image to read the fine print, but across the top of the bill head, Mr Ryan promises "Horses Shod According to the Natural Formation of the Hoof. Satisfaction Guaranteed." There's nothing new about the new school of thought on natural hoofcare. In the 1800s, a legion of learned professors and prickly posers preached any number of plausible and implausible theories about the so-called natural function of the hoof, as they interpreted it to be at that time. Most of the theories involved employing the frog by using a thin shoe or even a three-quarter shoe that exposed the heels and base of the frog to concussion, in the belief that that would stimulate the pumping action of the frog. 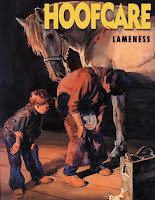 Professor Bracy Clark in England was the leading proponent of truly natural hoofcare, and his writings are quite interesting and worth a read. Just the reverse of Ryan in Baltimore, he was a veterinary surgeon--in the earliest days of the profession--who left academia behind and chose to shoe horses and study the hoof for the rest of his life. Professor Clark enjoyed a renaissance about ten years ago when Dr Hiltrud Strasser chose selections from his vast body of writings to defend some of her theories. What many people missed was that he was a highly respected veterinarian and actually has a very broad body of writing on the anatomy and function of the foot and its diseases, far beyond simply expressing displeasure with shoes. In fact, he tried tirelessly to invent horseshoes that would work in harmony with the natural function of the foot and not stifle it. The author/historian Major-General Sir Frederick Smith writes of Bracy Clark, "No writer in the profession before or since [his] day has brought to bear such a degree of scholarship." In fact, Bracy Clark's first writings were exactly 200 years ago, in 1809. So let's tip our caps to him today. I recently learned that a packet containing Professor Clark's 1809 manuscript sold at auction for 3,130 British pounds--that's roughly $5,000 for some very frail old farrier papers. ...This little collection opened with an illustrated 1809 account of A Series of Original Experiments on the Foot of the Living Horse. On the back of the frontispiece to this main work is a tipped-in prospectus in which Clark explains that he plans to publish his discoveries from time to time but ‘…must depend upon the intelligent and opulent for support in reimbursing the expenses…’, while bound in at the end is a single explanatory leaf, titled A New Exposition of the Horses Hoof, that refer to a pasteboard model of that equine extremity. Other tracts in this little volume included Essays… on …the Nature and Cure of the Split-Hoof, Vulgarly Termed Sand-Crack and …the Causes and Cure of Running Frush in Horses’ Feet, both of which are dated 1818, plus another of 1822 …on the Canker and Corns of Horses’ Feet. 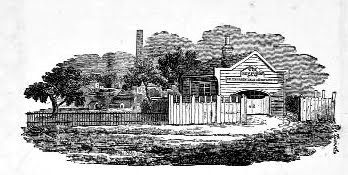 Another of the seven items that make up the collection is the advertisement ...., in which Bracy Clark announces that he has retired from all work with horses, ‘except what relates to the feet only’, and has opened a "…forge, in the Edgeware Road, near the Paddington Turnpike, for shoeing Saddle Horses, more especially, upon a New Plan, which admits the natural expansion of his Foot, and is more durable than the common shoe." I got out my magnifying glass and was able to read some of the tiny print in Professor Clark's ad. I could read that he added at the bottom "Shoes made and sent (for ready money) to any part of the kingdom. No rasping off the natural rind of the hoof, no frog scalping--or notching of the heels allowed. A lecture on shoeing and the nature of the foot is delivered by the inventor the first Monday or every month at 12 o'clock. Admission 5 shillings." He would teach "professional characters" how to shoe according to his method for one price, and the sons of shoeing smiths for a reduced rate. And now the big question: who bought these precious historic manuscripts? And what will he or she do with them? Here's Bracy Clark's treatise on his tablet expansion shoe; the images are on the last pages. You can click on "full screen" at top right of the image box to read it easily and print it. The pages may load slowly, depending on the speed of your connection. I hope you will read it and realize how articulate this man was in describing the foot and his theory of hoof expansion. Read the part where he says that this shoe is his gift to horses, and that he is not patenting it so that more horses can benefit from it. In that sense, reading this reminds me of the Steward Clog. What would I give to go back in time and head to Regent's Park for one of his Monday lunchtime lectures? This fellow's writings are worth a read, a re-read and many good long discussions to see where and how we've changed the way we look at the hoof's function. What would he say if he showed up today? Old Smithy, originally uploaded by ronclark5329. Here's the second stop on our tour of the great pub signs of the world that honor the horse's hoof and its culture and craft. I don't know where The Old Smithy is, but perhaps one of the blog's readers from the British Isles will fill me in. Thanks again to Mr. Ron Clark, the expert and tireless photographer of interesting pub sign art, for capturing another beautiful sign to share with us. I thought this image was just stunning and if I was driving down the road and saw this hanging from a building I'd probably smash into something (although I usually do that anyway when I drive in Britain). I think the artist was pretty creative on this one: what do you see in this picture that you probably wouldn't see in real life...on either side of the Atlantic? Click on the word "Comments" below and type in your answers. This video clip was shot at an FEI World Cup Dressage qualifier in Europe last week. Luise and Julie from Epona TV were surprised that a rider at this level schooled this stallion for as long as two hours in a hyperflexion frame. They grabbed the camera when they noticed that the horse's swollen tongue had turned blue. The horse's lips were curled and apparently even the rider could see it, as he stopped and put the horse's tongue back into its mouth. Apparently the schooling ring steward did not see anything wrong with this rider's method. Click here to read the full story about this videotape and about the effects of the curb rein and bit of a double bridle on the horse's tongue. FEI rules discourage what is called hyperflexion, rollkur or "bite the chest"--riding with the horse in an overbent neck and head position for a prolonged period of time. The practice is the subject of last year's best-selling horse book, Tug of War: Classical vs Modern Dressage by German veterinarian Gerd Heuschmann. Since last spring, Heuschmann's DVD If Horse's Could Speak has been on sale and goes even further than the book to tie overschooling, disconnected riding and especially overflexion/rollkur to unsoundness and musculoskeletal injuries in dressage horses. But it is very, very hard to prove the dots are connected. The DVD is 75 minutes long and is sold in North American format (NTSC) format. The cost is $60 per DVD plus postage. Click here to read more and order from our secure web page. You can order the book as well. I thought that by the time the DVD was translated and available here in the USA the subject of rollkur would be forgotten but I guess that is not the case. In a special interview with Olympics champion Anky Van Grunsven on Epona TV, Anky defends her use of hyperflexion as a training method, saying that she uses it for a few minutes at a time, then lets the horse relax, but that she only uses it on her advanced horses, and horses that are strong enough to do it, and for whom it is easy to go to that frame. She said she varies the time that she stays in the overbent frame from horse to horse, depending on how strong the horse is and how it reacts to being in that frame. In a riding demonstration, Anky pointed out that her horse was pricking his ears while in the overbent frame. Julie and Luise's Epona TV is a subscription-based library of equitation-science videos with interviews and demos by Gerd Heuschmann, Hilary Clayton, and many behavior and welfare experts. They are making a tremendous effort to provide a service that is a level above what you will find almost anywhere else on the Internet. Our mid-week humor is provided by a demonstration of anvil shooting, which is usually pretty entertaining in itself but the fact that the main character in this YouTube video claims to be the world champion suggest that there is some sort of a competition in anvil shooting. How on earth would you judge the winning shoot? Are points given for technique or difficulty? I might have to get some ear plugs and a helmet and go check this out. The failures might be entertaining. I thought anvil shooting was illegal; obviously it is not in the state of Missouri. 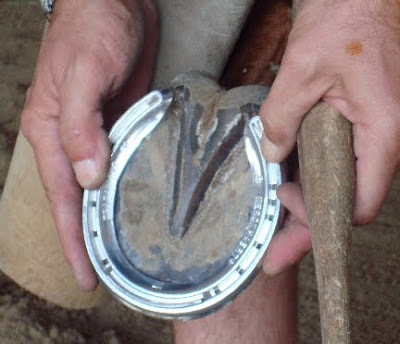 What kind of horse shoe is this?, originally uploaded by Rock and Racehorses. Imagine the confused looks when someone spots this horse's hoof print. The Daily Racing Form announced today that the defections are beginning; the field for next month's Breeders Cup Classic has lost a few interesting entries. First it was the news that the fast-closing gray Macho Again would not make the trip west to Santa Anita after developing a cough while training at Churchill Downs in Kentucky. Then it was the withdrawal of California-based Rail Trip, pulled from contention because of bruised frogs. Apparently Rail Trip sloughed his frogs after his last start at Del Mar and his feet are still tender, according to Steve Andersen of the Form. The race is still three weeks away, so the horse's trainer must be pretty concerned about the horse losing training. Sloughed and bruised frogs are a common complaint from horsemen in California on the artificial tracks. The problems could be compounded by the heat of the track in summer months. It is normal for real-world horses to shed the outer layer of their frogs, but racehorses are shod and trimmed so often that their frogs are kept neatly manicured. Horseshoers at the track have a lot of tricks to help a horse with sore frogs. This photo by our friend Sarah K Andrew was taken during Breeders Cup week at Santa Anita last year. This horse is wearing a frog-protection plate, sometimes called a mushroom shoe. It can either be an aluminum plate that goes between the shoe and the hoof (some of them look like hockey goalie masks and are called spider plates), or it can be a shoe. The same type of shoe or plate is used to relieve pressure on sore heels. The horseshoer may medicate the frog and pack felt or foam rubber under it if the goal is to cushion a sore frog. Conversely, if the frog is healthy and the goal is to relieve sore heels or a quarter crack, the horseshoer will use the plate to "engage" the frog to bear weight while trimming the heels to relieve weight on them. There are many reasons a frog can be sore. Infection from thrush or canker is the most common but abrasion also can cause soreness, particularly if a horse has a bulbous, protruding, or fleshy frog. Frogs can and do bleed if they are aggravated enough. The type of shoe shown here might have been just for training and the horse was reshod with regular plates before training at speed or racing. Standardbreds will race in frog plates, though. Since the horse spends most of the day in its stall, the trainer would pack the sore hooves with a favorite packing or wrap Animalintex poultice against the bottom of the foot. Turbo tubbing, salt water soaks and spas, foam-lined boots and changing stall bedding are some other treatments that trainers may try to get the frogs back in racing shape. Away from the dry California climate, a frog could be sore because of excess moisture. In that case, the trainer might medicate with a hoof product containing ingredients from the formaldehyde family to wick moisture, or paint the feet with iodine. Exercise, even walking, would be considered therapeutic, unless the horse is lame. Circulation can help feet recover and grow. Protecting soles and frogs and preventing injury will be on the minds of trainers who ship their horses to California for the Breeders Cup. When the European and East Coast trainers see local horses sporting plates like the one in this picture, they will catch on very quickly. UC Davis's instrumented shoe might be one of the most expensive horseshoes ever made. The soundtrack is "Going the Distance" by CAKE. Are you counting the days to the 2009 Breeders Cup, the international championship of Thoroughbred horse racing? If so, get ready to start counting the ways that Santa Anita's Pro-Ride racing surface will be interpreted as enhancing or handicapping the chances of the top runners. The running of this year's cup at California's showcase racetrack has inspired a renewal of the debate of just how safe and just how fair to bettors and horsemen the artificial surfaces will be. Perfect timing, then, for the J.D. Wheat Veterinary Orthopedic Research Laboratory at the University of California at Davis to release this little video slide show about its use of an instrumented horseshoe in their study of horse racetracks at Kentucky's Keeneland racecourse. This study was conducted on Polytrack, not the Pro Ride used at Santa Anita. The study is comparing hoof impact on synthetic, dirt and turf surfaces. Three horses were tested. Hoof accelerations and ground reaction forces (GRF) were measured for the front legs with an accelerometer and a dynamometric horseshoe during trot and canter (not the gallop). Maxima, minima, temporal components, and a measure of vibration were extracted from the data. Acceleration and GRF variables were compared statistically among surfaces. The dynamometric horseshoe contained piezoelectric sensors sandwiched between two aluminium plates. 1. The synthetic surface often had the lowest peak accelerations, mean vibration, and peak GRFs. Peak acceleration during hoof landing was significantly smaller for the synthetic surface (mean ± SE, 28.5g ± 2.9g) than for the turf surface (42.9g ± 3.8g). 2. Hoof vibrations during hoof landing for the synthetic surface were American Journal of Veterinary Research (AJVR). Click here to read the abstract as posted by AJVR. The debate is contentious enough that it will take a lot of studies of many parameters to quiet skeptics. The defection of the USA's top racehorse, champion Rachel Alexandra, has been attributed to her owners' distaste for running on synthetic tracks. Conversely, top European horses are flocking to Santa Anita and defecting from turf to "dirt" races with the belief that their turf races prep them for spectacular results at Santa Anita. Last year's Classic winner Ravens Pass followed that formula. The Bird cousins, Summer and Mine That, have relocated to Santa Anita and trained over the Pro Ride surface on Saturday. Watch for more reports from Santa Anita as the surface debate is sure to elevate in the next two weeks. Farrier's Arms, Worcester, originally uploaded by ronclark5329. Mr Ron Clark is a photographer in Great Britain with a delightful passion for photographing pub signs. Among his archives are quite a few with horse themes and many with horseshoes, farriers, heavy horses (always my favorite) and related namesakes, usually accompanied by interesting or downright beautiful artwork and ornate brackets, signposts and lanterns. Over the next few months, The Hoof Blog will be showcasing some of these unusual bits of artistry, and we invite you to send in your favorites as well. It is very kind of Mr Clark to open images from his collection to viewing on the blog. And there are some real beauties, as well as some intriguing titles. They'd make a beautiful book. I'd love to know who paints the pub signs and if there are rules to follow or if they all just happen to be tastefully done. The Farriers Arms is quite a modern pub sign and is a reproduction of the famous painting, "Shoeing the Bay Mare"; the well-known image was originally created by Sir Edwin Henry Landseer in 1844 and is probably the most universal farrier image in the world. Landseer's other horse and dog paintings are beautiful, too. Get ready for a long (artistic) pub crawl around the British Isles and, if we're lucky, other places in the world! Email hoofblog@hoofcare.com with your favorites or leave a comment below. The Farriers Arms, by the way, is in Worcester, England. Laminitis Conference Discount Deadline Is Today! Important information: Your registration includes all meals plus the now-famous Saturday night dinner cruise. But the deadline to contact the conference is today, October 15! 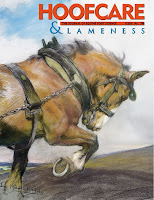 Speakers include (among many) Hoofcare & Lameness authors Chris Pollitt, Paul Goodness, Katy Watts, Scott Morrison, Michael Wildenstein, and many more. 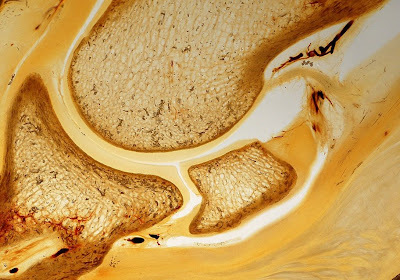 Laminitis researchers from around the world will report on university-based research while a practical program brings the latest and most creative treatment and management information for all types of foot problems from lameness specialist veterinarians and clinic-based farriers. A special presentation by Dr Pollitt will feature his high-definition videography of wild horse hooves in Australia and his extrapolation of wild horse hoof data as it compares to and contrasts with domestic horses, as well as the normal hoof functions in contrast with laminitis hoof functions. 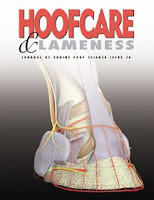 Dr. Mike Steward from Oklahoma will review and update his development of the Steward Clog low-tech support system for laminitis and Dr Amy Rucker of Midwest Equine will focus on venograms and coronary band resection. On the non-laminitis side of the conference, Pat Reilly, Paul Goodness and a support crew from Forging Ahead, James Gilchrist, and Michael Wildenstein will have farrier expertise to share, along with Dr. Morrison from Rood and Riddle Equine Hospital and Dr Rucker, who many of you will remember from the Bluegrass Laminitis Symposium. The reduced registration rate of $550 per person to the Hoofcare & Lameness community is even lower when two people register together. Please check the conference web site for details. Conference brochures were sent to all Hoofcare & Lameness subscribers, but if you didn't get one, let the conference registration know that you haven't had reference to the program. The conference admin phone number is 781 697 0469. Email is sponsor@laminitisconference.com. If that doesn't work, call me at 978 281 3222. I probably cannot answer your question, but I can find someone who can. Thanks for supporting this conference. Pony stallion Dale, before (top) and after (lower) his rehabilitation by World Horse Welfare. A married couple in Lancashire, England have been banned from keeping horses for five years in one of the first court cases in Britain since a new animal welfare law has been enacted. The two were found guilty of causing suffering by not addressing their ponies' obesity and hoofcare issues. Keith and Lynn Hall pleaded guilty to causing unnecessary suffering to a 21 year old mare called April and failing to meet the needs of a 12 year old stallion called Dale. They were also given costs of £500 each and a three month curfew was imposed, enforcing them to be resident at their home between the hours of 10pm and 6am. They indicated their immediate intention to appeal their five year ban. 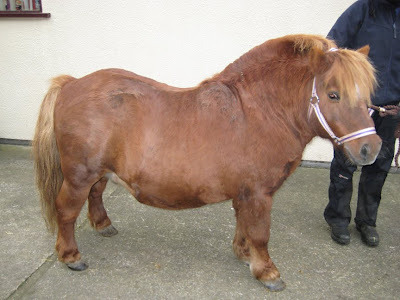 When World Horse Welfare and RSPCA officials visited the couple’s rented field in November 2008, they found that April’s feet had not been trimmed for a very long time and she was lame and in terrible pain. Her companion Dale had been allowed to become grossly overweight. Both ponies were seized and taken to a World Horse Welfare farm where they immediately received the care they needed. Dale was put on a strict diet and exercise program and has recovered well but sadly April did not respond to treatment and the difficult decision was made to put her to sleep and end her suffering. Please visit www.worldhorsewelfare.org for more information. World Horse Welfare provided background and photos for this blog post. Blogger's comment: Is it possible that the owners were trying to make the ponies look like Thelwell's cartoon characters? 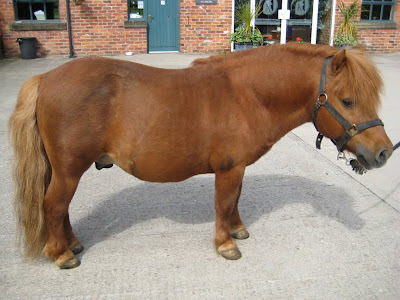 Are there people who believe that ponies are supposed to be fat, cresty-necked and lame? Click the box second from the right at the bottom of the screen to make this full screen; hit the audio button to increase the volume. Just hit "escape" to exit the full screen mode. Make it big, play it loud. Go ahead and cheer. A sigh came out of me from some deep place today when I learned that the world's #1 racehorse, Ireland's Sea the Stars, will not be coming to the USA after all. He will not be running in the Breeders Cup at Santa Anita next month. After winning the Prix de l'Arc de Triomphe in Paris last week, he'll be transitioned to stud duty. This nicely edited tribute clip-mash is a great salute to his stellar year at the top of the racing world. So many years we endure the coming and going of racing stars, the tragedy of injury, the revolving door of media favorites. And this year, we're so lucky to have some (pretty) sound, athletic horses. They are running their hearts out and performing consistently, even on off tracks. If you have some time, go to YouTube and look up the channel of Partymanners and watch the races he has posted there of Zenyatta, Rachel Alexandra, Summer Bird, Careless Jewel, and so many others. Check out Muscle Hill over in the Standardbred world. We have a dream team of superstar horses out there, minus one now. But retiring him on top, and presumably uninjured, is pretty special too. Maybe my sigh was a sigh of relief. Click here to read an article about Sea the Stars from The Times of London. It's Columbus Day, so you're invited to "discover" a new equine anatomy reference tool that will be a boon to your ability to creatively and constructively communicate with colleagues, clients and students no matter where you are. Plastination is a tissue preservation process that gained worldwide fame this decade with the Body Worlds museum exhibit. The last I heard, Body Worlds was set to overtake King Tut as the most viewed exhibit in the world. It shows human organs and muscles preserved in various positions or medical conditions. But everyone I know came out of it saying, "Wow, if they could just do that for horses..."
And someone has. Germany's veterinary anatomy expert Dr Christoph von Horst has patented a process for preserving veterinary specimen in this way; he's done birds and rats and ticks and dogs. 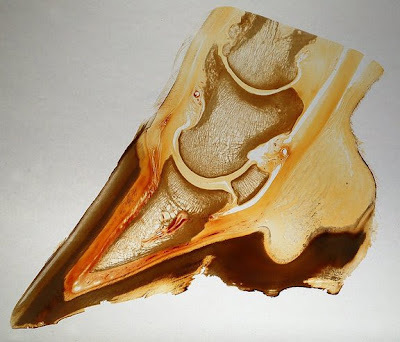 But thanks to the encouragement of people like Dr. Chris Pollitt and a loud cheer from Hoofcare and Lameness, Dr Von Horst is preparing spectacular hoof and distal limb anatomy specimen, and you end up with a hoof music video slide show on a day of discovery. I remember for years how I struggled trying to learn anatomy from textbooks. I couldn't get the 3-D part. I believe that 3-D models from HorseScience are the absolute way to learn and study anatomy and that they revolutionized my ability to understand the hoof, to the extent I can say that I do. These plastination models are a step somewhere between anatomy models and an x-ray. They come in different models, designed for more or less portability. Many will slip inside a briefcase or agenda planner...or even a jacket pocket. I can't wait for you all to see these teaching aids. They are like living x-rays...in equally-living color! They are actual paper-thin slices of tissue vacuum sealed inside layers of crystal clear acrylic resin. You can keep one in your briefcase, or collect a set to show different conditions like laminitis, a navicular cyst, ringbone, etc. or use them to show where a shoe will sit, where you will trim (or won't trim) or where an injection or surgery site will access a joint or problem. The specimen come in two types: flat sheets, which are about 3/8" thick, or the block versions, which are about 3/4" to 1" thick. The blocks are stunning and look fantastic on a desk or bookshelf, particularly if there's a light nearby. They make a beautiful gift or presentation award. Of course, no two are alike. Hooves are available in sagittal, coronal and transverse sections, with the vast majority being sagittal, since that is the primary view people are accustomed to using for reference. Right now we even have a foal's limb and a huge draft horse lower limb with what Dr Von Horst labels as lymphangitis-type swelling. There's also a stunning example of pastern ankylosis. 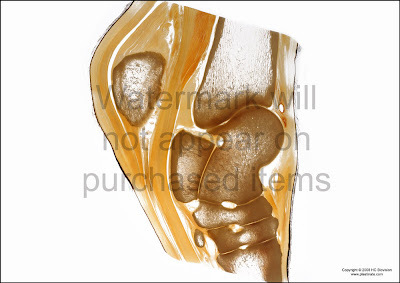 Also available are laminated posters of several popular types of distal limb and hock plastinates; you can write on the plastic, draw a shoe or cast on, or use the poster for teaching by asking students to fill in labels for specific structures. Plastic casts of the blood supply and plaster casts of hooves are available by special order. The best news? Prices start at under $100, plus shipping, with the blocks selling for about $200 at the current exchange rate. 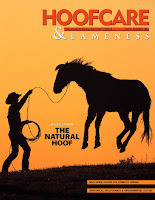 Be sure to visit the Hoofcare and Lameness booth at conferences this fall to see these amazing teaching and learning aids, or contact the office to arrange an order to be selected and shipped directly to you. If you have trouble with my video widget, you can also view the slide show on Hoofcare's slowly-expanding video channel. The widget seems to be skipping over some of the images in favor of text slides. Farrier Steve Stanley -- 2009 Lexington, originally uploaded by USTrotting. Thanks to the US Trotting Association for this nice photo of Steve Stanley working at the Red Mile harness track in Lexington, Kentucky two weeks ago. Steve wasn't looking up and smiling for the camera because he was working on a shoe for three-year-old filly Southwind Wasabi, who would go on to win the Moni Maker Trot that day. The filly came from last place to win the race. She is owned and trained by the same connections as the 2009 Hambletonian champion, Muscle Hill. 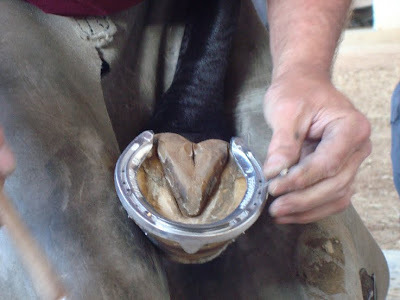 Long-time University of California at Davis farrier Kirk Adkins shares some tips that may be useful when trimming or treating the hooves of older, arthritic horses or horses that have difficulty standing on three legs because of painful laminitis or neurological conditions. This video may be helpful for some horses out there, and I thank Kirk for taking the time to put it together. I have also seen people stand horses on padding, put padded boots on the feet not being worked on, and keep thick scraps of carpet close at hand for cushioning. If I had to guess, I'd say the "lean against the wall" option is the one I hear recommended most often, but that's not very safe for the horse or the humans around it. None of us likes to see a horse go into restraining stocks like those used for a draft horse, but there are some interesting hoist rigs that people are making that, if used safely on horses that are well-trained or sedated, may be useful to just get the horse elevated enough to relieve the pain of standing on the opposite foot. If you have ideas for solutions to this problem, please share them with Hoofcare and Lameness. Friends at Work: "Go Over to the Pub and Get Paddy the Farrier..."
Farrier at work, County Kerry, Ireland, originally uploaded by yetiger. Here's a little humor for a Sunday. Show me a photo of normal people doing something and I'll try to imagine the relationships between them, and what they were doing and saying before and after the shutter clicked. Just a little mental exercise. This photo was made to order. All the information I have is that it was taken in the town of Boolteens in County Kerry in the west of Ireland in 2006. My story is that the owner of the pony gives tourists rides somewhere around the Ring of Kerry and his pony lost a shoe so he went looking for a friend whose uncle's sister-in-law is married to a farrier. Half a day later, after hunting down and visiting with the uncle and the sister-in-law, and promising to take along a grandchild, they narrowed down the whereabouts of the farrier to the village pub (the building in the background looks like it could be a pub). They went to the forge and got his shoeing box and hoof stand and stormed into the pub, much to the farrier's surprise. Would he come out on the sidewalk and nail the shoe back on? Since they had all this gear, he couldn't refuse, just merely shrugged and asked, "What took you so long? We heard you been leading that lame pony all round the village half the afternoon?" And the grandchild is still tagging along because, in Ireland, kids always tag along. I love the wave of the horse holder, who could be the owner of the pony but his friendly expression makes me think he could be the landlord (bartender). The intense gaze of the fellow in the white shirt makes me think he's the owner of the pony. He's thinking about all the money he's not making while the pony is unharnessed from the trap. And he's no doubt ready to haggle with the farrier over the price. What story would you make from this photo? Congratulations to Georgia farriers Doug Workman and Dave Purves for a great job introducing a CNN news crew to the finer points of horseshoeing. Explaining the rocker toe was probably too complex for the minute-and-a-half time slot...but maybe they'll be back! Thanks to Allison Zeger at Farrier Products Distribution for her help with the ornery html code for this video! If Macy and Woolworth and Bean and Sears are some of the great family names of American retailing industry, you could certainly make a case for "Davis" being one of the great names of the American farrier industry. The Davis family's Ken Davis and Sons in Richwood, Ohio is one of the largest and deepest farrier supply stores in the world. They carry everything...or will get it for you. So it is with great sadness that we tell you that one of the family icons has passed away. R. Don Davis was one of the two sons in Ken Davis and Sons when he started working with his father and brother Jon in the 1950s. I'm sure when he was going from farm to farm to sell horse supplies to the Amish back then, Don had no idea what his efforts would turn into, or that after 50 years, it would still be a family business. Don's sons Dean and Scott run Ken Davis and Sons today, and do a great job of it. In the past ten years or so, many new farrier supply companies have sprouted up and some of the great old ones have passed to new hands. Ken Davis and Sons is one that always seems to stand with one foot in the past and one foot in the future...much like many of the great farriers I have known. It seems to be a surefire formula for success. For information about services for Don, visit www.stofcheck-ballingerfuneralhome.com.